To showcase our Artificial Intelligence technologies, the 3rd generation of Forpheus is featured at Hannover Messe 2017. Our friendly and smart table tennis collaborative robot has become a whole lot smarter since last year. It can now interpret, predict, learn, think, act, connect and communicate with humans. AI will revolutionize the manufacturing industry. It is a collection of multiple technologies that enable machines to sense, comprehend and act—and learn, either on their own or to augment human activities. How does this benefit your production environment? Let your line operators focus on what they are the best at. AI will do the rest. AI has the ability to learn from experience and improve over time. Prescriptive and predictive maintenance are powered by AI that continuously improves its recognition of real-time patterns. With the huge growth in machine data it is becoming impossible for your line operators to see patterns in big data. AI recognizes and reports such patterns immediately and suggestions are given to your operators on how to fix irregularities. This means no downtime with sudden stops or with unnecessary maintenance on your factory floor. The AI will indicate when maintenance is really necessary; not too soon, not too late. Forpheus is the smartest, most attentive member of the Omron family. It is an AI driven table tennis robot, and we are all very proud of it. Hannover Messe is your unique opportunity to experience the self-learning aspect of AI by playing a game with Forpheus. Our collaborative table tennis tutor robot is driven by artificial intelligence to be able to help humans to improve their game. 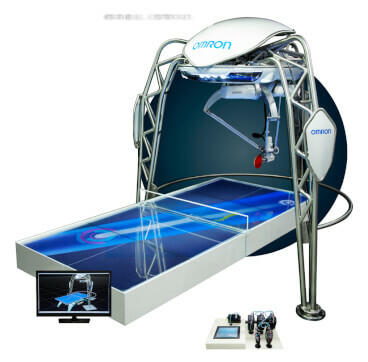 “Our table tennis robot has been trained for many hours by table tennis players of all levels, allowing Forpheus to recognize patterns in skill levels. As a result, Forpheus tailors its play to each individual to improve the game of the players. We like to expand such advanced technologies in close co-operation with our clients for industrial purposes”, says Tim Foreman, European R&D Manager at Omron Europe. Come and see how we envision your factory to implement AI. This is your unique opportunity to play a match against Forpheus. Do not miss out on it!